"Let's go to Planet Green together." Boba the Bear fears a fire on the stove and is whisked away to safety on Planet Green via magic travel dust. Matilda, picnicking with her parents, finds Boba in his box nearby and takes him home to play. 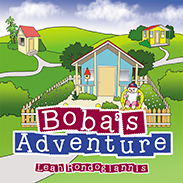 She and her friend Frankie discover that Boba can talk, and he explains that he comes from Planet Blue where there was a fire and he was frightened. The book is bright from cover to cover, and the pictures are lively and vibrant. The illustrations are obviously drawn by a true professional because young children should be able to relate to every picture. From a room full of toys to a starry night gazing out the window, children will practically fall into the pages. Young readers might even feel relief from whatever frightens them by practicing reading and immersing themselves in this book. The large print and well-chosen font make this an inviting read for any newly developing reader. While at times challenging with a few multisyllabic words, an advanced kindergartner should be able to read it with little help. Rondogiannis knows how to draw developing readers in with simple phrases such as "Did that bear just talk?" The underlying message of handling your fears with imagination and escapism are clear and helpful. Don't we all wish we could be transported with a magical dust when things get frightening, and then be brought back home when the coast is clear? Kudos to the author for helping young children sleep better at night, imagining a Planet Blue and a Planet Green, a Mum for advice and security, and a friend to share it all with.